The chapter on fine structure theory presents an abstract approach to fine structure theory of acceptable structures. 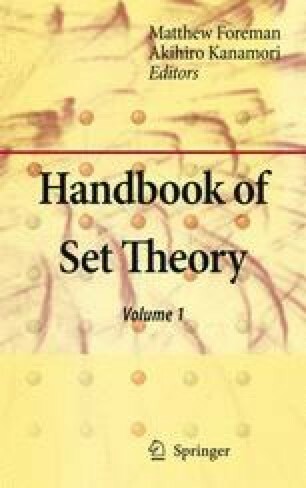 No prerequisities are assumed except basic set-theoretic background, so the chapter may be considered an introductory text into the subject for a broad audience. Apart from this, the text is intended to be a prerequisite to Handbook chapters “Covering Lemma” by W. Mitchell and “Outline of Inner Model Theory” by J. Steel. The presentation of the material reflects this intention. The material covered in the chapter includes basic facts about acceptable structures, detailed treatment of projecta, standard codes and reducts, and extensions of embeddings theorems. At the end of the chapter two classical applications of the theory are sketched: Jensen’s construction of a square sequence in L and his proof of the Covering Lemma for L.
William J. Mitchell. The covering lemma. Chapter 18 in this Handbook. 10.1007/978-1-4020-5764-9_19. Ernest Schimmerling. A core model toolbox and guide. Chapter 20 in this Handbook. 10.1007/978-1-4020-5764-9_21. John R. Steel. An outline of inner model theory. Chapter 19 in this Handbook. 10.1007/978-1-4020-5764-9_20. Philip D. Welch. Σ* fine structure. Chapter 10 in this Handbook. 10.1007/978-1-4020-5764-9_11.